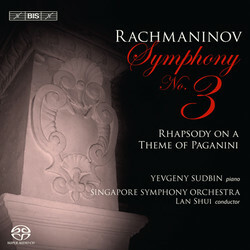 Klassik Com: Triple 5 Stars April 2012; Limelight Magazine: "These two major works from Rachmaninov’s last decade form a substantial and varied program, given here in excellent performances and recorded in very vivid Super Audio format. Thirty-something Russian virtuoso Yevgeny Sudbin gives a dashing account of the Rhapsody on a Theme of Paganini, investing the work with all the requisite drama, colour and wit. ".